Matchroom Boxing Italy, Opi Since 82 and DAZN are delighted to announce the second instalment of their historic eight-year joint venture in Italy. Following the huge success of their inaugural event at the Teatro Obi Hall in Florence in November, the trio will host a night of Championship Boxing at the Superstudio in Milan on March 8, shown live on DAZN. Three title fights top a stacked nine-fight card that features an array of emerging Italian talent. 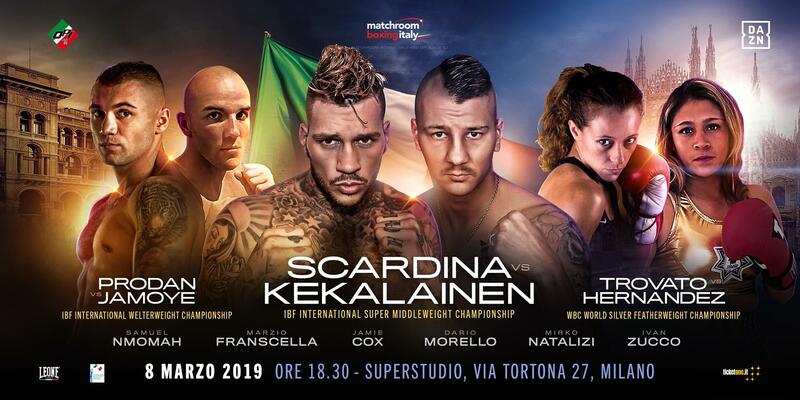 Rozzano’s undefeated Super-Middleweight talent Daniele Scardina (15-0, 14 KO’s) fights for his second professional title takes on Finnish Super-Middleweight Champion Henri Kekalainen (11-5, 5 KO’S) for the IBF International crown. Ukraine’s rising Welterweight powerhouse Maxim Prodan (15-0, 14 KO’s) gets his first title shot when he meets former Belgium Super-Lightweight Champion Steve Jamoye (25-6-2, 5 KO’s) for the IBF International Welterweight title. In the evening’s third title fight, Milan’s former World title challenger Vissia Trovato (12-1, 5 KO’s) takes on Mexico’s Erika Cruz Hernandez (9-1, 3 KO’s) for the WBC World Silver Featherweight title. As part of the landmark partnership, Matchroom Boxing Italy, Opi Since 82 and DAZN are determined to rebuild boxing in the country and inspire a new generation of fighters by showcasing the best up-and-coming talent. Verbania’s Super-Middleweight starlet Ivan Zucco (6-0, 5 KO’s) aims to impress in his first televised bout, former Italian Welterweight Champion Dario Morello looks to extend his unbeaten run to 14-0, Roma’s Super-Welterweight Mirko Natalizi (3-0, 2 KO’s) takes part in his fourth pro contest, with action elsewhere from 6-0 Super-Middleweight Marzio Franscella and Novara Super-Welterweight Samuel Nmomah (9-0, 3 KO’s). Swindon’s former World title challenger Jamie Cox (25-2, 14 KO’s) fights in Italy for the first time as he aims to get his career back on track following defeats to George Groves and John Ryder.